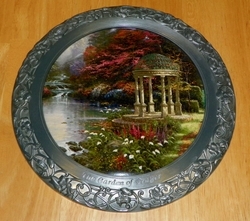 Thomas Kinkade Collectibles tapestries, flags, collector plates, holiday ornaments and figures. Thomas Kinkade is America's most collected living artist. Coming from a modest background, Kinkade emphasizes simple pleasures and inspirational messages through his paintings. As a devout Christian, Kinkade uses his gift as a vehicle to communicate and spread inherent life-affirming values. After the film, Kinkade earned his living as a painter, selling his originals in galleries throughout California. In 1982, he married his childhood sweetheart, Nanette, and two years later they began to publish his art. Thom passed away on April 6, 2012 at his home. Find Your Thomas Kinkade Collectible Now!